Heat oven to 350°F. Spray bottom and sides of rectangular baking dish 13x9x2-inches, with cooking spray. Spread 3/4 cup of the pasta sauce in baking dish. 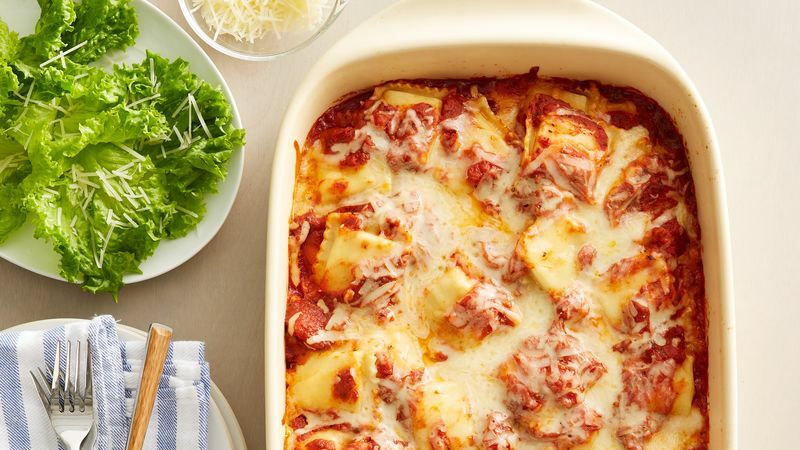 Arrange half of the frozen ravioli in single layer over sauce; top with half of the remaining pasta sauce and 1 cup of the mozzarella cheese. Repeat layers once, starting with ravioli. Sprinkle with Parmesan cheese. Cover with aluminum foil and bake 40 minutes. Remove foil; bake uncovered 15 to 20 minutes longer or until bubbly and hot in center. Let stand 10 minutes before serving.. Frozen stuffed pastas, either cheese or meat-filled, are a good freezer staple. A spinach tortellini is another option to have on hand, great in this quick baked dish or in soups or main-dish salads. Switch things up with the cheese you choose—mozzarella melts beautifully, but so do other softer Italian cheeses, like smooth Provolone (try one that’s smoked), a nutty fontina, or a pungent taleggio. Make an easy crunchy topping to contrast the gooey casserole. Toss coarse dried bread crumbs with the grated Parmesan or Romano cheese, a dash of dried Italian herbs, and a generous grind of freshly ground pepper. Sprinkle over the casserole before baking.